A local authority has been criticised for fitting bars to town centre public benches to stop homeless people sleeping on them. More than 2,000 people commented on a photo of a bench in Bournemouth which was posted online on Saturday. Some Facebook users accused the council of being "inhumane", "disgusting" and "disgraceful". Bournemouth Borough Council said it had received "numerous complaints" about benches being used by rough sleepers. 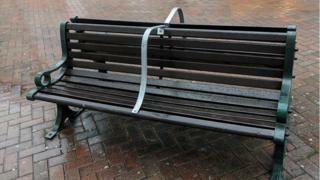 The picture was posted by Bournemouth artist Stuart Semple, who called the benches a "design crime". He said seating had been "retrofitted" with bars in the town centre. "What it says in essence is we don't want homeless people. That's horrendous, they have every right to be there," he said. The council said it had made changes to "one or two benches in very specific locations in the town centre several months ago" following complaints from traders and the public. "The complaints related to a number of the benches being unavailable to members of the public throughout the day due to people lying on them during the daytime," a statement said. "As a council, we need to maintain a careful balance between our responsibility to the wider public to ensure that amenities are available to them, and our duty of care to vulnerable members of our community, including people rough sleeping." It added that the council delivered a wide range of services, including 150 hostel beds, for homeless people. In June 2016, the authority said it had bought one-way train tickets for rough sleepers to move them out the area, as part of a new £200,000 strategy using "assertive techniques and procedures". In 2015, the council played music from Alvin and the Chipmunks and bagpipes to deter rough sleepers at Bournemouth coach station.